Beachorado: RIC #37 Disclaimer: I only own ONE bear stamp. So here's the thing. I got the inspiration image and I was all set to do this edgy modern graffetti thing...it was going to be great! THEN Tasnim says, hey did you see the bear? And that TOTALLY made me see the bear, which would be fine, but I only have ONE bear stamp. 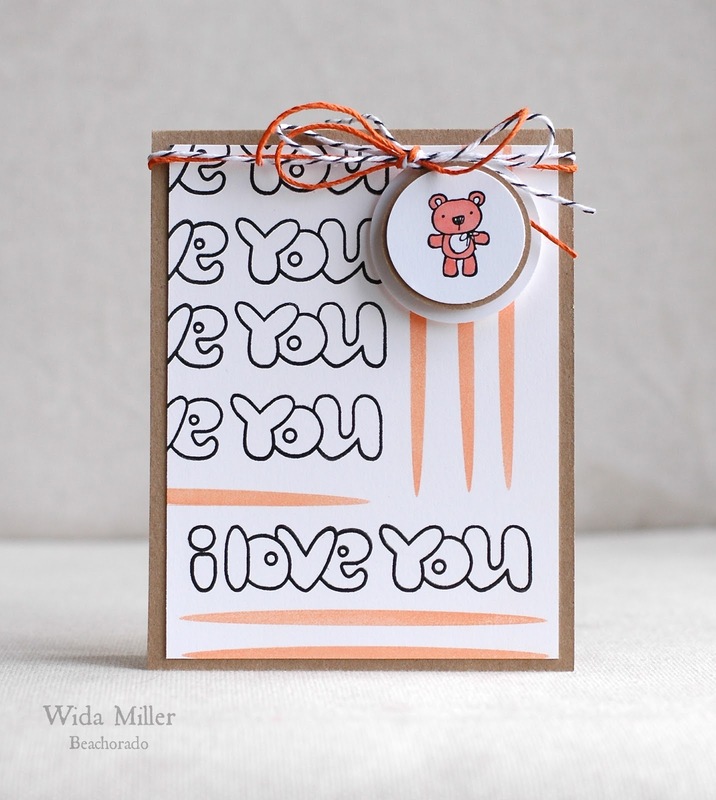 A cute, little, cuddly Stampin Up! bear stamp. The prize is a GC to Paper Smooches! I used SHADOWS and WORD UP to create the background. Check out the rest of the Runway Inspired Challenge DT...I am anxious to see if they used a bear too in their designs. See ya on the runway people!! Wow! You have done great job interpreting that photo, Wida! I LOVE that brush strokes and the bubble font sentiment repeated. And that teddy is so darn cute. Love your card. I am going to play this challenge because I love the inspirational photo and your card has given me an idea (Ding!) lol! Nope, completely missed the bear but I do remember doing that font at upper primary school. Thanks for the step back in time. Wida that bear is totally 'Edgy', love it! Tasnim has a great eye. I think it's super cute! Wida, your card is totally cool, and that bear is the cutest! Seriously, I love the layout of your repeated stamped design! You just keep making the best RIC cards, my friend! AAAwwweee! Your card is a design keeper in my book! I love it!! love your interpretation. Love what you did with the little bear and the sentiment. That is SO bloody amazing. I love the text off the edge like that sooooooo much! LOVE this!!! The bear is adorable! Great interpretation of the inspiration photo! I always love your creative post titles. Lovin' those bubble letters. So funny that I never even noticed the bear until I wrote my post, duh! Now it's all I see. Love how you used the shadow stamps, too. Oh yeah, I love the design and the cutey little bear! Edgy. And cute at the same time. I'm inspired to finally test the water this week! OMG, the bear! I never saw the bear! Really love the eclectic style of this card. The stripes could be claw marks created by that tiny bear, ha! Perfect take on the inspiration! Love the swipes of color and that bitty bear!! I love the edgy/cool/cute mix! Nice move to use the bear..it looks great! Hahaha, no, I totally did not notice she had a bear, of all things. But I guess that's what makes it edgy, right? Something that you would never expect. That being said, I think your "bear card" captures the spirit perfectly. Bubbly letters are cutesy, but repeating them in b&w and off the edge make them edgy. Throw in some tiger stripes, and call it a day!